The DP63900-S series has been discontinued. Please see the Platinum Series as a possible alternative or contact our sales department. The DP63000 Series panel meters for process voltage and current or strain gage bridge inputs offer many features and performance capabilities to suit a wide range of industrial applications. 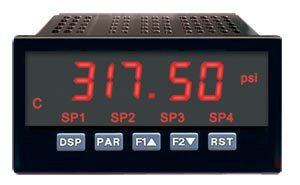 The meters employ a bright 14 mm (0.56"), sunlight readable, red LED display. The intensity of display can be adjusted from dark room applications up to sunlight readable, making it ideal for viewing in lighting conditions. A standard green LED is available as an option. They have been specifically designed for harsh industrial environments with NEMA 4X (IP65) sealed front bezel and extensive testing of noise effects to CE requirements. A variety of field installable plug-in option cards are also available to enhance the unit’s capabilities. Option boards are available for setpoints/alarms, analog output or serial communications.